Download iNaturalist on your smart phone. Join our Northeast Alpine Flower Watch project. Contribute important data while you explore the outdoors! You don’t need to be an expert to identify key species and contribute to this project. Citizen science is an established tool for producing reliable scientific outcomes, and we’re proud to have your help. 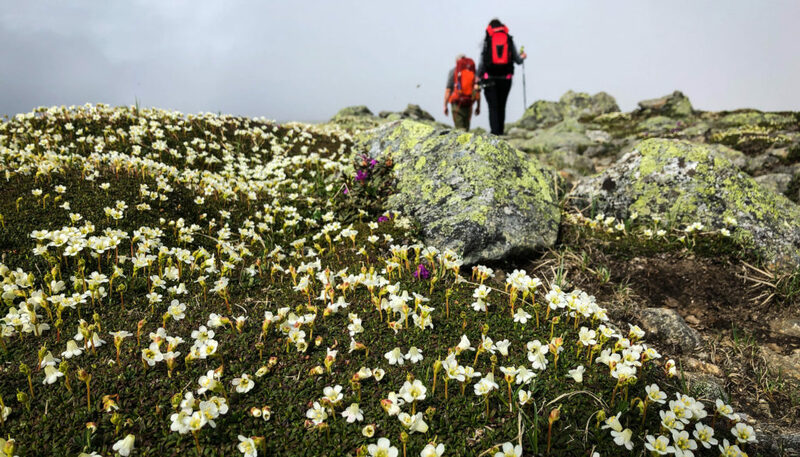 The Northeast Alpine Flower Watch tracks the effects of climate change by gathering flowering time data with the help of hikers in alpine areas. AMC has partnered with the Adirondack Mountain Club, Green Mountain club, and Baxter State Park to achieve this goal in New York, Vermont, New Hampshire, and Maine. This study is an extension of Mountain Watch, our long-term monitoring program tracking how plants are responding to climate change. Since 2004, AMC has been monitoring the timing of plant seasonal events like leaf-out and flowering in conjunction with weather conditions. From day one of this project we’ve relied on the help of hikers to tell us what they’ve seen along the trails. By taking photos of flowers on your hike this summer, you can help too! Phenology is the study of the timing of seasonal events like flowering in conjunction with weather conditions. Long term phenology data is a useful tool to quantify plant responses to climatic change and to identify which species might be most vulnerable to a shifting climate. To understand mountain phenology, researchers need a lot of data from different mountain ranges, elevations, and time. This is where citizen scientists come in: while hiking, you can provide valuable data by capturing pictures of flowering species along the trail. Going for a Hike Above Treeline? Northeastern alpine areas are isolated “islands in the sky,” located above tree line on mountains in New York, Vermont, New Hampshire, and Maine. Alpine areas are populated by arctic species that often have long lifetimes and short growing seasons in extreme conditions. These remnant species are rarely found anywhere else in the Northeastern United States. Arctic plants’ reliance on these unique environments makes them especially vulnerable to climatic change. You don’t need to be an expert to identify key species and contribute to this project. iNaturalist has a built-in algorithm to identify plants and a large community of enthusiasts to confirm your best-guesses and unknowns. There are also other resources for you to use such as the New England Alpine Summits book. iNaturalist is a tool that crowdsources plant and animal observations through a free app on your phone or tablet. Our project uses it to focus on the flowering season of alpine plants in the northeastern US. (1) Download the iNaturalist app and register. If you don’t have a chance to do this before you hit the trail, you can always do it once you are back and reviewing all the flower photos from your hike! (2) Turn on location in your mobile device if you have turned it off previously. This ensures that your photos are dated and geo-tagged so that when you use the iNaturalist app the photo brings that data along. (3) Take photos of flowers, especially our target species. Take a photo of the whole plant if possible and a close-up of flowers or fruit. You should take photos while in the iNaturalist ap,p but any photo you have captured with your phone’s camera can be uploaded later, even previous years photos. Using the app will ensure that more accurate location data is logged. (4) Join our iNaturalist project. By joining the “Northeast Alpine Flower Watch” team you can streamline your contribution to AMC’s research and get updates on the project through iNautralis journal posts. Be sure to select ‘allow researchers to see coordinates’ when you join so that we can use the data you’ve collected. Observations not posted to our project are still accessible for research, so snap away! Don’t forget to Check back in on your iNaturalist submissions so you can learn more as you go. iNaturalist has built-in identification technology and plenty of fellow naturalists who can help confirm a species and move your observation to “Research Grade”. This allows AMC’s scientists and other researchers to use it in our work. The more photos we take, year after year, the more we can learn about flowering and fruiting times and the impact of climate change. No, you can use iNaturalist on a computer, tablet, or other devices. We strongly encourage you to use the iNaturalist app if possible because it provides the best location information. Do I need cellular service when I take a photograph with my smart device? No. Most smart phones and tablets are GPS enabled and use satellites to geo-locate and date your photographs. If you are in a remote location with no cell service this information is still captured with each observation. However, your ability to upload observations to the main online server and the iNaturalist apps auto-identification capacity will not function well. You can make multiple observations but can wait to do the final upload until you are back with cell service. Are my photograph location coordinates saved online? Yes, your coordinates will be saved and public, unless you choose to make the observation private or obscured when you upload your photos. More information about privacy is available online. Is registration with iNaturalist required? Yes. In order to upload observations, you will need to register with an email address. Please register before you go and explore plants and animals of the region! Do I need to be able to identify plant species? No. You can upload images without identifying the species. You can learn more about the plants you observe through iNaturalist which can offer auto-identification suggestions through the app or even after the images are uploaded online. Other iNaturalist users and our staff also can help you identify your species. Can I take pictures of other species? Yes. This project is focused on 6 alpine species, however, all observations submitted to iNaturalist will be helpful. AMC Scientists will analyze the targeted species alpine flowering information as part of our Northeast Alpine Flower Watch study. Other researchers will have access to all the observations submitted to ask their own questions and to track biodiversity. You can see other examples of projects here. The species we’re tracking have easy-to-observe reproductive phenology and represent a wide variety of life history and ecological traits—including flower timing, functional types, and geographic distributions. Crowdsourced flower observations from hikers provide spatially and temporally rich data that we wouldn’t be able to collect otherwise. They allow us to research how plants are responding to the changing climate. AMC is proud to partner with the following organizations in the Northeast Alpine Flower Watch project, which is generously funded by the National Geographic Society and the Toomey Foundation.